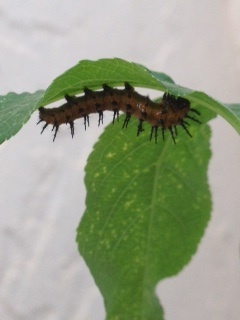 One of the G.F. (Gulf Fritillary) cats (caterpillars) is now a chrysalis. It is Friday, May 22, 2015. While counting the rest of the cats, I find a second chrysalis with no idea when it formed. It seems to have appeared out of the magical unseen. There are a total of nine C & C (cats and chrysalides) I’m keeping track of with a mark on the calendar on when to expect a butterfly to emerge in great hope I can see the miracle. On Saturday, May 23, 2015, I find another G.F. in the head down ‘J’ position in early morning. My photo shows another cat in the background. By late morning the ‘J’ cat is almost a complete chrysalis. I can still see his caterpillariness as he moves and twists. These cats have done a number on the passion vine. I will need to take cuttings and start more plants as this population boom continues. I read about using a large pickle jar as a temporary incubator so I can see the butterfly emerge without having to move leaves and stand on my head. On second thought, I would prefer a net enclosure like the ones that display the cats and chrysalides and butterflies so beautifully at The Butterfly Estates. Their setup is topnotch and they explain information in a way that encourages everyone who visits to want to try creating a habitat at home. I check a few stores and find exactly what I’m looking for! I would have preferred white, but it’s navy blue, as close to perfect as I can get. I really like how the butterfly cage has a zippered top and zippered side which allow me to trim a branch with a cat, or use a small potted host plant with a cat, put both in the net enclosure until he forms his chrysalis. I can release the butterfly within a few hours of emerging and have the pleasure to watch him fly. It’s sort of selfish, but since they don’t seem to be on my schedule and I’m not on theirs, we compromise. A small plastic puddling dish with rocks and sand is now buried near the nectar plants. Eventually I’d like to get something more like a birdbath dish to give the flying wanderers a place to rest their weary wings and puddle together. It would be fun to see their antics. Sunday, May 24, 2015, One of the cats didn’t make it. I notice a very thick silk attachment and just the molted ‘skin’ of the cat. I did not see him there before now. The evidence is down low in the plant near the soil. Usually they don’t get that close to the soil. The fourth G.F. is in J mode. I account for all five cats and the other three chrysalides, not counting the deceased one. The cats are eating ravenously and from their size, about two inches long, will most likely form their chrysalides tomorrow. As I look over the damage to the poor passion vine, I discover four new cats! Thirteen total, and I’m certain I have not found them all. Fascination pulls me into a vortex of curiosity. I wonder why I never noticed butterfly eggs, caterpillars, or chrysalides before now. Perhaps we are not supposed to learn everything about everything in one lifetime. It leaves room for excitement. The Butterfly Estates mesmerize me during my visit on April 25, 2015. 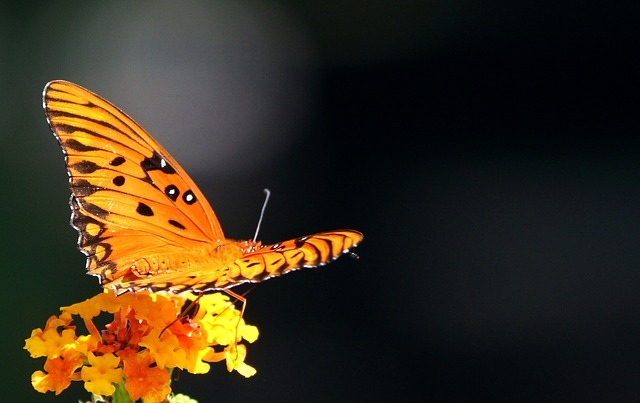 The women I meet there demonstrate an intense devotion to raising and releasing butterflies humanely and organically. I feel the passion in their eyes and tune into the excitement in their voices as they explain and show me the life stages of a multitude of colorful dainties. They accomplish their focused mission by nurturing the butterflies all the way through to release day each week. They invite the community to play a part for a brighter today and more beautiful tomorrow with butterflies playing a vital role. I am instantly hooked. The greenhouse is a calm haven in the middle of the city. Never have I seen so many butterflies in one place. Soothing music plays in the background and the light rumble of a nearby waterfalls echoes rhythmically from the koi pond nearby. It causes me to slow down and absorb the scenery. The pond supports four turtles, small koi, and a Butterfly Koi. Very fitting. I borrow an identification chart to match up the real thing to the name and sketch. 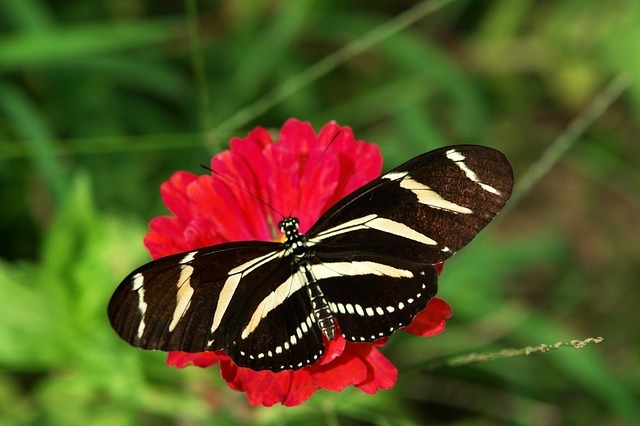 I am familiar with the black and white striped Zebra Longwing, the state butterfly of Florida, and the Monarch’s fame for migrating the longest distance of any butterfly. 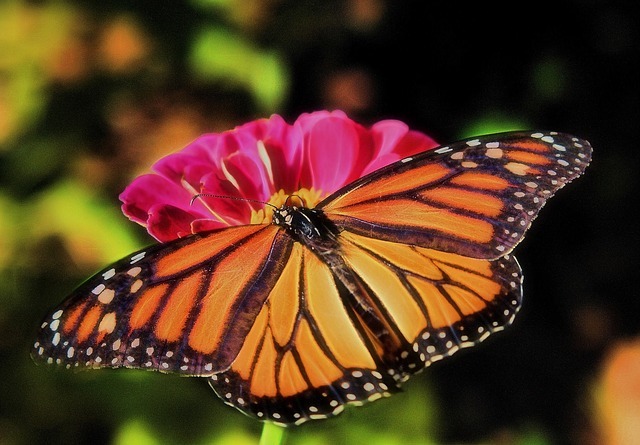 The Monarch’s near endangered situation, due to lack of habitat and use of pesticides by humans, causes much concern among butterfly enthusiasts. By the time I am nearly done with my stroll through the greenhouse, I have identified several different butterflies. My short list includes Malachite, White Peacock, Great Southern White, and Orange Barred Sulphur, along with those mentioned elsewhere in this post. I hear myself ask about starting a butterfly garden at home. I already have swamp milkweed seeds sprouted and growing specifically for Monarchs. Adding more to this endeavor is a stretch for me, since I have not have all that much luck with plants in the past. I’ve had good luck with orchids and Christmas cactus on my lanai. As I drive away, tucked safely in the back of my car are four plant (two host plants and two nectar plants) to get me started. I learn from one of the employees who kindly carries two of the plants to my car that a bonus has come with my passion vine: butterfly eggs! 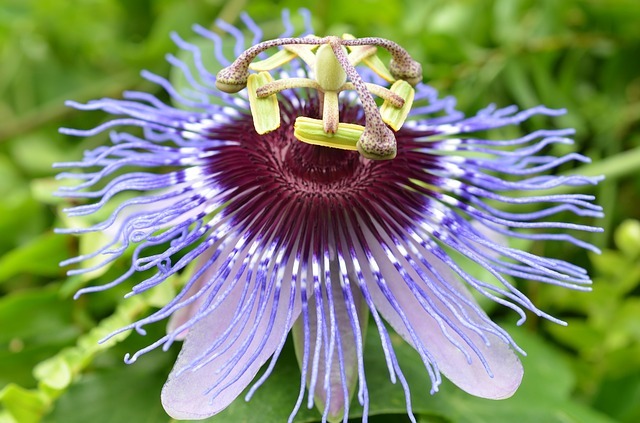 Three butterflies are known to lay their eggs on the passion vine: Zebra Longwing, Gulf Fritillary, and Julia Heliconian. Giddiness rushes through my bloodstream. I wonder which one will appear in a few short weeks. The employee does not share further details and I do not ask. We both want it to be a surprise. After placing the plants in a protected spot where they get daily sun right out the front door, I count the eggs. Ten tiny yellow spots are huddled on two tender leaves at the tip of the plant. By the next day I become concerned that a predator might eat them so I cover them with a net bag and tie it to the lattice supporting the passion vine. Wrong move! By the following afternoon, the eggs have hatched into caterpillars and appear to be struggling. I carefully untie the bag and remove it, then strategically place the tiny creatures on various young leaves around the plant so they won’t have to compete for food. Wrong move! To my dismay, a few of them fall off my finger. I feel horribly sad! All but one looks like they will die soon. What have I done? If I want the rest to survive, I must rethink my selfish need for involvement. I must become an observer and photographer only. Oh, and a plant waterer. Other than that, hands off! On May Day I count two caterpillars. No, three caterpillars. By the following morning I count four, then five. Five caterpillars! I hope there are both males and females since I don’t see many butterflies in my neighborhood. The little ones happily munch on tender leaves and then rest. I feel relief and water the plants, sprinkling a little on the leaves. The caterpillars seem to like it. 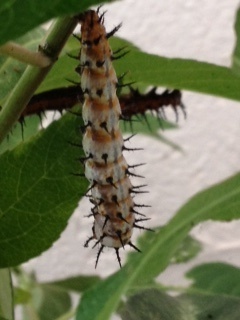 By May 4 the large caterpillar has turned darker than the rest. 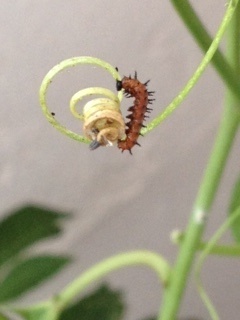 Two days later the big guy hides deep in the plant along a thick stem and had stopped eating. It takes a while before I find him. By the next day he has morphed into a chrysalis. I verify through photos taken with my cell phone, as I stand nearly on my head, blood rushing to my face, pushing leaves carefully aside with my fingers, that he must be a Gulf Fritillary! Will I be so lucky as to see him emerge from his chrysalis? It will take one to two weeks. A few days later three of the other four have become chrysalides, Zebra Longwing for sure. 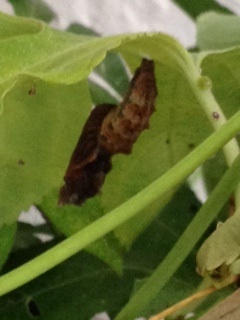 The bottom of their chrysalis looks like two rabbit ears. Unmistakable. I read that they fly more methodically and slowly. Attitude. They know how to stop and drink the nectar. Latitude. They are a lovely butterfly and tend to live longer than the rest, four to six months on average, so I hope to enjoy their company for some time after they emerge. With any luck, there will be two males and two females. Perhaps the females will return to lay eggs on the passion vine. I hope so. I look closely at the chrysalides and noticed brilliant gold specs in strategic places on the chrysalides. The detail is fascinating even from my upside down viewpoint. 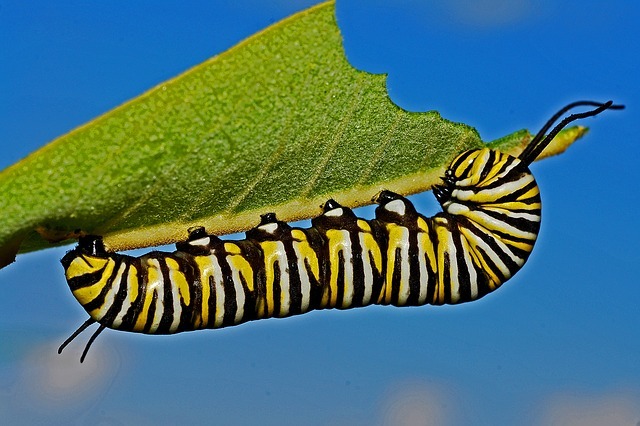 On May 8, the last caterpillar is in position for turning into a chrysalis. They all follow the same scenario: eat a large meal, find the way to a (partially) hidden place underneath a leaf and attach their hind end with silk to the leaf tip, leaf center, or stem during the daylight. They rest in a letter J position, head down and squirm and wiggle. 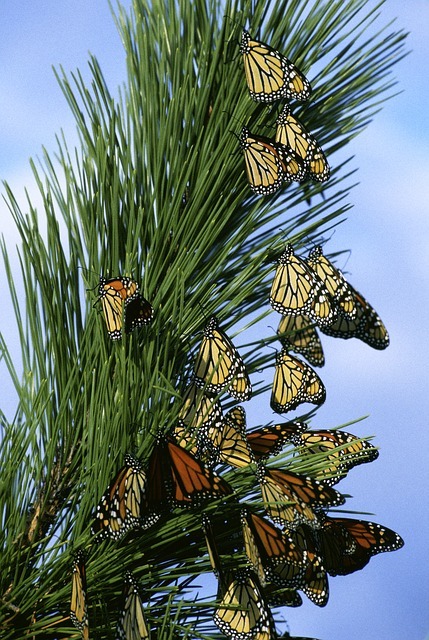 By the next morning their chrysalis is mostly, but not fully formed. It takes another day or so to harden into a protective shell. The magic continues. I look forward to the next few days for a well-timed glimpse of a chrysalis breaking open and a brand new butterfly emerging into the world.